The first batch of downloadable demos for retail 3DS games are now available on the Japanese Nintendo eShop. 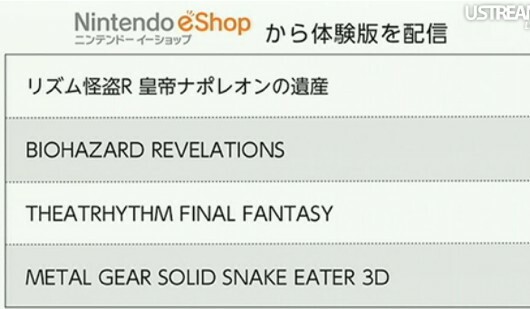 The selection includes Theatrhythm: Final Fantasy, Resident Evil: Revelations, Rhythm Thief, and Metal Gear Solid: Snake Eater 3D. It’s good to see that Nintendo is finally making good use of the eShop but they’ll really need to work on it to make it a digital alternative to brick and mortar shops (or at least be at par with the PS Store in terms of features, game availability, console support, etc). The games mentioned are expected to launch in the US around the same time as their Japanese releases. Unfortunately for anyone who owns a non-Japanese Nintendo 3DS and want to get a demo, you’ll have to wait things out as no official announcement has been release regarding availability for your region :/.